Spices are the keys that unlock the special flavors and aromas of many cuisines. Specially Indian food, which is prepared with variety of spices. Thes spices have been used to enhance flavor, add to digestion and are used by Ayrvedic practiners for ages. 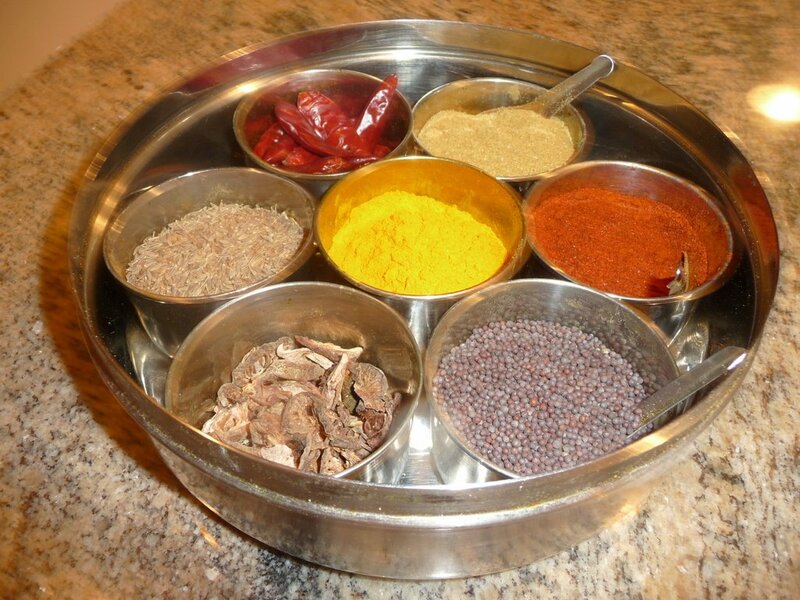 Every household in India has a spice box in the kitchen – a box made up of six or seven containers, each of which holds one of the spices the cook uses most often. Most boxes contain cumin and coriander powder mix, turmeric powder, chili powder, whole cumin, black mustard seeds, cloves, dry red chilies and other family favorites. Cha i spice is a combination of four or more spices. Most spices and herbs that we use in preparing food, come directly from plants that originated in Asia and Africa – from plant roots (turmeric and ginger) plant bark/stem (cinnamon, lemon grass) plant leaves (curry leaves, basil leaves, bay leaves, kasuri methi dried fenugreek leaves) from plant flowers (saffron,) plant fruits (chilies, paprika, nutmeg) and from plant seeds (cardamoms, cumin, coriander, mustard, fenugreek, anise seeds, black cumin, black pepper, cloves). Many were used for their medicinal purposes thousands of years ago, and for good reason. Turmeric, for example, has antibacterial properties that promote healing. Spices generally last for long time-if stored in airtight dry cool place, can last up to 1 to2 years. Most spices do not need to be refrigerated if they are used often, It is however advisable to check them every so often. The Corriander seeds should be refrigerated as the tend to spoil quickly. Most of the spices are available-whole and ground- in an Indian Grocery Store or a Middle Eastern Market. You may also check the Large Chain Grocery Store in your area who may have a special Asian section. When working with spices, it is important to keep all spices away from face and eyes. Most spices may not have allergies as they are used to promote good digestion and metabolism but it is good to check as the powder may go in the air. Buying Turmeric and Chili powder: make sure that the color is Vibrant and there are no bugs sitting at the bottom of the contaainer-to check the stock is fresh. Dhana Jeera: Buy it course ground if possible- it seems to enhance flavor of the food. Do not mix whole spices when storing. Genaral shelf life of spices is about 1 year but not knowing when how long it was on store shelfDiscard if you see any seeds bunched up togather or they are moist or the powdered spices are bunching up orr in hard lumps. Whole spices are generally roasted in oil before ccooking vegetablles and as a flavor enhancer aafter the Daals, soups after cooked. On raitas and chutneys they are used on top as well. Powder spices are generally used during cooking process. There are so mnay spices and herbs in the Cullinary art- you can explore them and see what you like to use. Once you know how to use spices, your cooking spectrum becomes wide open. Come experiment different flavors and spices and create colorful mouthwatering dishes. Check Spice box post for more about spices.